Wash the meat and keep aside. Wash the Potatoes, peal and cut into quarters. Heat Oil in a pan and sauté the onions and chopped ginger for a few minutes. Add the meat, salt and pepper powder and mix well. Fry for 5 minutes on low heat turning the meat well till the pieces get firm. Add sufficient water and the potatoes and cook till done. Continue simmering on low heat till all the water is absorbed and the meat and potatoes are brown. Serve hot with bread or rice. This dish is a mixed meat stew made with a combination of meat, chicken, pork and vegetables. It’s a very old Anglo-Indian recipe. However, any combination of meat could be used as per personal preference. The same recipe could be used with chicken only. This Stew was a must have for Christmas Breakfast in almost all Anglo-Indian Homes in the olden days and was eaten with bread or rolls. Cut the meat, chicken and pork into small pieces. Heat oil in a pressure cooker or a suitable vessel and add the onions, cinnamon, cloves and chopped garlic. Fry till the onions turn golden brown. Add the mutton, beef, chicken and pork together with the chillie powder, turmeric powder, pepper powder, salt coriander powder and tomatoes and mix well. Fry till the tomatoes turn to pulp. Add the broken dry red chillies, mint and the coconut paste and mix well. Add sufficient water and cook till the meat is soft. If cooking in a pressure cooker, cook for 10 minutes (6 to 8 whistles). Now add the chopped vegetables and vinegar and simmer on low heat till the vegetables are cooked and the gravy is thick. Serve with rice or bread. Clean and cut the fish into thick slices. Heat oil in a pan and add the curry leaves and onions and sauté for a few minutes. Add the ginger garlic paste, turmeric powder, chillie powder, coriander powder, cumin powder, and tamarind water and fry for 2 or 3 minutes. Add the coconut milk, salt and slit green chillies and a little more water if more gravy is required and bring to boil. Add the fish. Cook on low heat for about 7 to 8 minutes till the fish is cooked. Pour a tablespoon of oil on top then remove from heat. Shake the pan so that the oil coats the top evenly. Marinate the meat with a little turmeric powder, salt and a little curds for one hour. Heat the oil in a suitable pan and sauté the onions for a few minutes. Add the ginger garlic paste and fry for a few minutes. Add the chillie powder, coriander powder, turmeric powder, tomato puree, coriander leaves, remaining curds and salt and stir fry for a few minutes till the oil leaves the mixture. Add 1 cup of water and bring to boil. 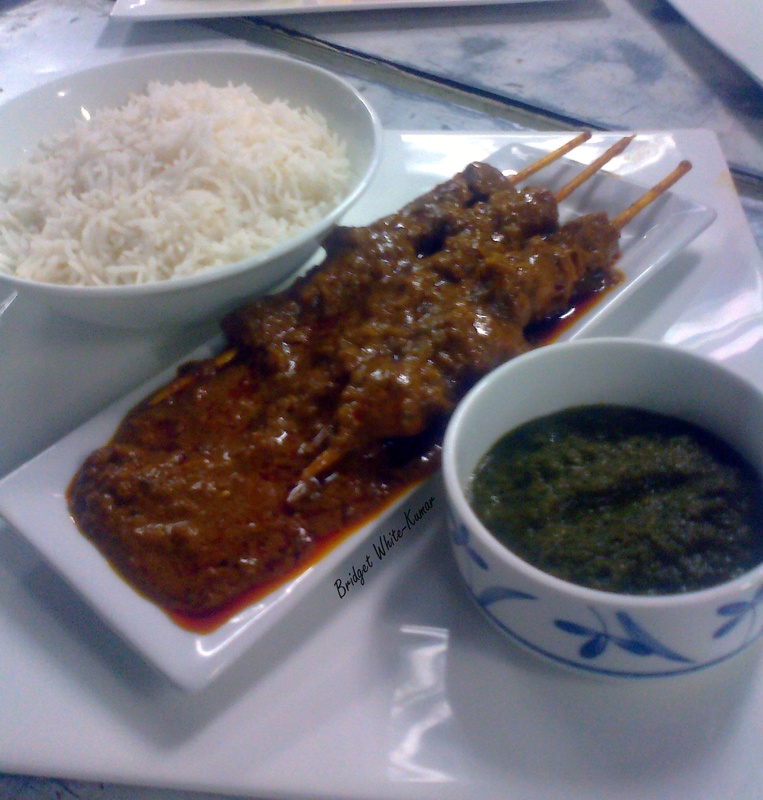 Meanwhile pass the bamboo sticks / skewers through the marinated meat. About 5 pieces should fit on each stick. Place the sticks of meat in the curry that is boiling. Close the pan and simmer on low heat till the meat is cooked. Serve without removing the sticks. Marinate the chops with all the above ingredients (except the onions and potatoes) and keep aside for 2 hours. Heat the oil in a suitable pan and add the marinated chops and mix well. Cook the chops with sufficient water till tender letting some soup remain. Mix in the sliced onions. Keep cooking on low heat till the soup dries up and the meat is a nice brown colour. Just before turning off the heat add the boiled potatoes and mix once so that the mixture covers the potatoes.